Taranto in Italy is a city with a population of over 190 000 people. The main attraction in this city is Taranto Aragon Castle, also known as Castel Sant'Angelo. This is the most photographed building in the city and surrounding areas. 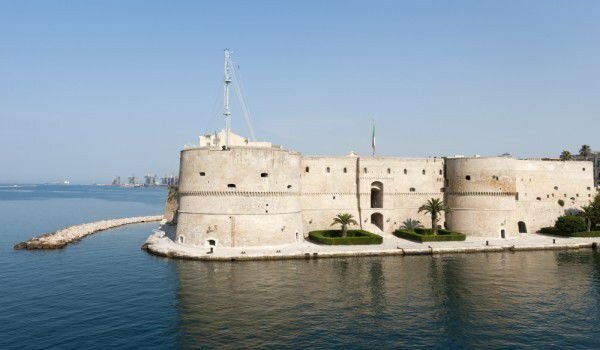 Overlooking the sea, Taranto Aragon Castle is an impressive building designed by architect Francesco di Giorgio Martini. It was commissioned by Naples’s King Ferdinand of Aragon at the end of the fifteenth century, whose idea was to build a castle with defensive purposes. The Normans built this building in order to protect the city on the foundations of the fortress Norman Suevian Angionian, which is actually a fortress built by the Byzantines before that time, for defense of the Saracens. Castle Taranto Aragon is located between Naturno and Plaus, at the foot of the mountain Tramontana. Its real name is Tarantsberg Castle. Also known as Dornsberg, the castle was founded by the family Taranto in 1217. Members of this family were the imperial ministers Tyrol. The castle is decorated with exquisite paneling, beautiful tiles, carvings around windows and doors, and many other items. The complex houses the Church of St. Leonard, whose walls boast antique paintings, and a winged altar. The castle is known as the place of marriage of the Princess of Taranto, Maria D'Enghien and the King of Naples, Ladislao of Durazzo on April 23, 1407. The four distinctive towers, called St. Laurence, St. Christopher, Annunziata, and Bandiera, complementing the castle and reinforcing its walls are of particular interest with their impressive size. In the sixteenth century, the castle has been renovated, altered and enlarged. The building is also used as a prison during the Habsburgs, and now is an office of the Navy. From 1291 his owner is Count Meinhard II, then by 1347 the castle became the property of Heinrich von Annenberg, followed by Count von Mohr, and later operated by the families Giovanelli and Fuchs. Since the end of World War II many different inhabitants have used the castle Dornsberg which, unfortunately, resulted in them damaging the building and contributing to the loss of many priceless objects. For a period of time the castle was even used as a hostel for young people, which totally ruins its interior. In 1964 the family Gottschall from Munich travailed the complex buying and restoring it with extreme efforts to make it shine again. To this day it is owned by the family. Visits to the castle, which has preserved valuable facts about the medieval history of the area, unfortunately, are absolutely impossible. Tourists from around the world are eagerly awaiting the moment the family owning the castle will open its doors to visitors. Now, however, the castle now only attracts their attention and can be photographed for memory, but only from the outside.